I am a big fan of Google Forms – a fantastic customizable survey tool. If you have access to Google Drive through your school email address or have set up your own for free, then you can create amazing forms to meet the needs of your classroom. A Google Form is a survey tool that lets you pick and choose what type of questions you want to include. You can access Google Forms that you have created on any web browser (laptop, iPhone, Android tablet, etc). When you submit data into the form the information goes to a spreadsheet that is automatically created for every Google Form you make. 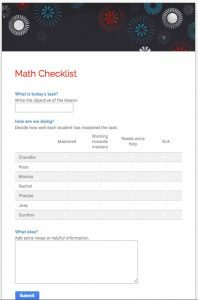 The example on this post is a Math Checklist. It shows how you can combine a short text response (objective) with a grid (rows and columns with student name and level of mastery) and with a paragraph text response (extra notes). When you open up this form each day you can type in the objective and note student performance. All of the information pops up in the spreadsheet shown below with a time stamp. Google Forms are great tools for collecting student data especially during formative assessment opportunities. Try using this tool to gather information on student performance in your learning environment! I’ve hosted many webinars on Google Forms – check out my Events page to see what’s on my calendar!